PHARMACEUTICALS AND HEALTHCARE: El dorado!! All marketers including pharma marketers are in search of an El dorado - a rich vein of market opportunity that will create a blockbuster brand or a family of blockbusters. The above pig story is on the same lines. 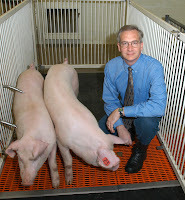 Featured in the above image are genetically engineered pigs that are rich in omega 3 fatty acids. They are the omega 3 pigs (or boars actually)! The USP is supposed to be omega 3 rich pig meat that even avoids concerns of heavy metal poisoning in fish!! I got the above image from here. So where are the El dorados' for pharma marketers today? Pharma marketers visualize two market opportunities in the contemporary world. The first is the mass market opportunity. Drugs that are based on the concept of one-cap fits all. For eg., statins like atorvastatin or NSAIDs like celecoxib. The second is the targeted drug therapy (niche market opportunities). This is a tight market. Many of the drugs in the targeted drug therapy market are biologics. Biologics is a broad term, however, this term is used mainly to indicate products manufactured using recombinant DNA technology or genetic technology. The first biologic or biopharmaceutical was recombinant human insulin. Another famous drug in this class is recombinant erythropoietin. Monoclonal antibodies (MABs) are also important drugs in this class used for fighting infections, cancer, and autoimmune diseases like RA (rheumatoid arthritis). Biologics are very attractive to pharma marketers chiefly for two reasons - high margins and they are not very easy to duplicate by generic marketers. So you can hold on to your market for longer. Further, most biologics address chronic care markets - this means good revenues. Pharmacogenomics is responsible for growth of the targeted drug therapy market. Pharmacogenomics deals with the study of genetically influenced variations of response to drug therapy. Each person has a unique genetic profile (genotype of a person). Response to drug therapy is influenced by these genetic variations. When Bristol Myers Squibb launched pravastatin (a statin that reduces blood cholesterol levels), they found that the drug acts in about 85% of the population who had a B1 allele of the CETP gene. The drug was not effective in people with B2 allelic variant. This means the drug targeted only a section of the population. Similarly, Herceptin (trastuzumab) is a breast cancer monoclonal antibody drug. This drug binds selectively to HER 2 receptors (proteins). When Herceptin blocks the defective HER proteins, the breast cancer cells do not reproduce uncontrollably. However, Herceptin is effective only in those patients who have the defective HER NEU 2 gene ie. HER 2 positive patients. The rise in the application of pharamcogenomics is leading towards PERSONALIZED MEDICINE. Drugs are given based on the genetic susceptibility or genetic profile of a person. New drugs are invented and targeted to patients who have the genetics compatible to the drug profile. An interesting example is Gleevec (imatinib) that is given to patients suffering from chronic myeloid leukemia (a type blood cancer). Imatinib works by inhibiting an enzyme called tyrosine kinase. When this enzyme is overactive it leads to growth of leukemia cells. Imatinib is effective in 95% of the chronic myeloid leukemia patients as they have a defective gene (called the Philadelphia chromosome) that makes more of tyrosine kinase. 20% of the blood cancers are chronic myeloid leukemia. Hence, imatinib is the first-line therapy in most of chronic myeloid leukemia patients. Imatinib is an excellent example of personalized medicine. HOW DO TARGETED DRUG PHARMA MARKETERS WIN THE RACE? To successfully commercialize targeted drug therapies like imatinib, or rituximab (Rituxan, an anticancer monoclonal antibody) pharma marketers use a concept called HYBRID PHARMA MARKETING. In fact, this approach can be used to bullet proof commercialization of any new pharma product too. The niche marketing approach of HYBRID PHARMA MARKETING is not a rocket science - yet it is simple and elegant. Step 1: Identify OPINION BUILDER doctors in the niche segment targeted by the new molecule. For example, if it is a new MAB for rheumatoid arthritis, establish relations with say 50 to 100 RA experts and make them the opinion builder doctors for this new drug candidate. Simultaneously, identify and start communicating with patients - particularly through the internet - who will be interested in such a new molecule. Keep both, key doctors and patients in the loop as the drug passes through the various clinical trial stages. Step 2: Use the opinion builder doctors' suggestions and share information as the molecule goes through the phase 1, phase 2, and phase 3 clinical trials. Invite patients through the web, to participate in the drug development process. Create patient opinion builders who will lobby and demand for the quick development of the drug. These patients are 'primed' to accept the drug, if and when the drug is commercialized. In essence, the above is intense PRELAUNCH MARKETING even as early as 5 years before the drug makes it from the lab to market. CLINICAL TRIAL DATA IS A CREDIBLE AND POWERFUL FORM OF PRELAUNCH MARKETING. Step 3: Ensure a steady stream of publications in journals. More the documentation, higher is the success of the new molecule. Publications build data, and confidence. Build the buzz through journal advts., articles, talks at conferences, and publications. Science based marketing requires data and this helps in differentiation of the product so that the real patients who will find it useful will drive the demand and consumption. For eg., nateglinide was specifically sharply positioned for glucose spikes post meals. HYBRID PHARMA MARKETING is the process of marketing to doctors and patients. This involves well planned prelaunch activity to soften the ground and ensure success of the new product. Patients are very important demand creators as the net has enabled the empowered patient. Biogenerics are preferably known as biosimilars (or follow-on biologics). The market for this segment is 100 billion USD of the global 1000 billion USD pharma market. To commercialize biosimilars, additional efficacy and safety data has to be generated. It is not as easy as chemical generic marketing. To succeed with a biosimilar brand one has to win the confidence of the target doctors, that the value preposition is similar to or better than the original innovator product. What better than use the principles of HYBRID MARKETING?! Let us say, during the entire process of developing the additional data for a biosimilar product, each MR enrolls one opinion builder doctor in his territory for the prelaunch activity. Further, simultaneously, patients are kept in the loop through the web. So these doctors and patients are already primed to receive the biosimilar as and when it is commercialized. Prelaunch activity, publications, conference talks, and creating the buzz; and communication with opinion builder doctors and a pool of prospective end consumers (patients) are the cardinal features of HYBRID MARKETING. The approach of hybrid marketing helps the new product gain a quick lead when commercialized. The principles of HYBRID MARKETING incorporating the above aspects can be applied to new mass products too. This will enable quicker success, and establishment of the product as a market leader. Thanks for reading this blogpost, please do scroll down read all other blogposts, click on older posts, when required, kindly inform your acquaintances of this blog.